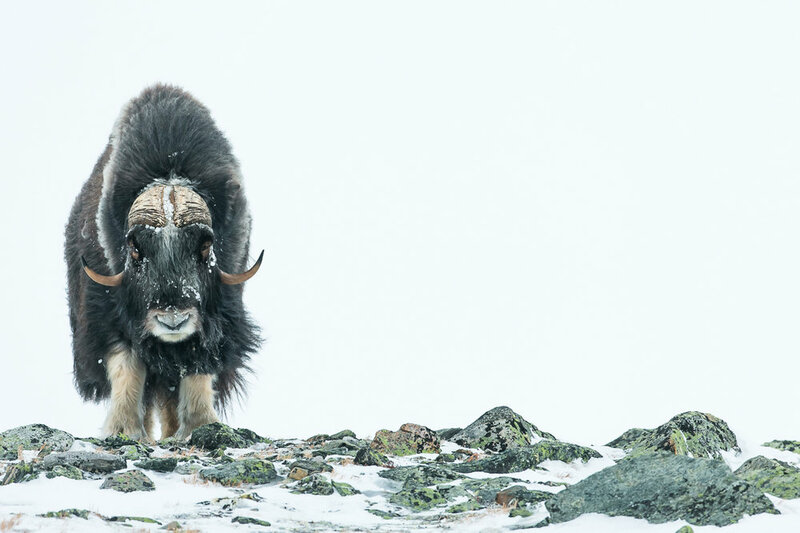 As wildlife photographers we are often driven to some of the harshest environments on the planet in pursuit of our next photographic project. 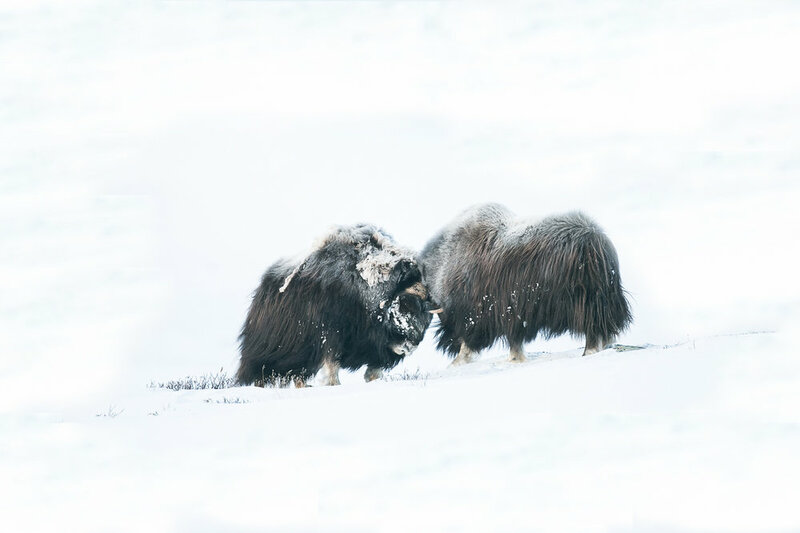 A few years back, I was inspired by Vincent Munier's work with the Musk Ox in Dovrefjell during the cold Winter months. So last year I decided I would follow in his footsteps and experience this harsh & unforgiving environment for myself. I had already led a number of successful tours to Dovrefjell during the Autumn months with good pal and expert Norwegian guide Floris Smeets. I decided to contact him and ask about the possibilities of visiting the park in Winter as he knew the area amd the animals better than most. Plus he has experience camping in these extreme conditions. Which in all honestly. I did not. So after a few months of planning the trip was on. So the adventure begins. From the outset, I knew this was going to be a special trip. First, we had to go deep into the park. Where we had planned to set up base camp for the trip. Due to the amount equipment we needed to take into the park it would not be possible to hike. Floris had arranged a dog sledding team to take us into the park. 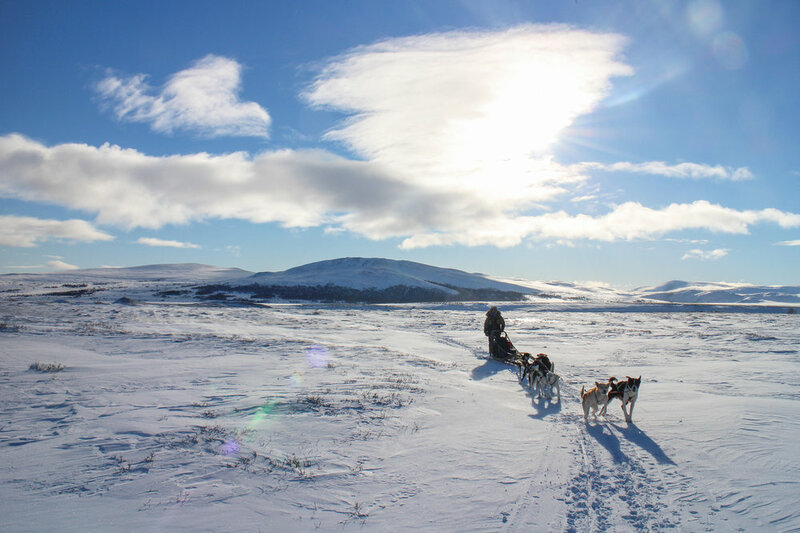 There is something really exciting about hearing a full team of Huskies bucking & barking before being set off into the unknown. What an introduction into the park and I only fell off twice, which for me I hail a success. 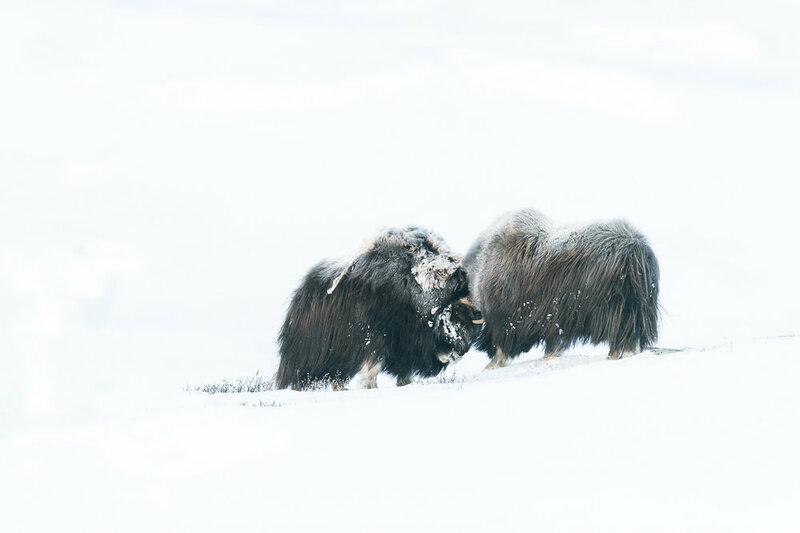 After an hours hiking we got within range of our first photographic opportunity with the Musk Ox. 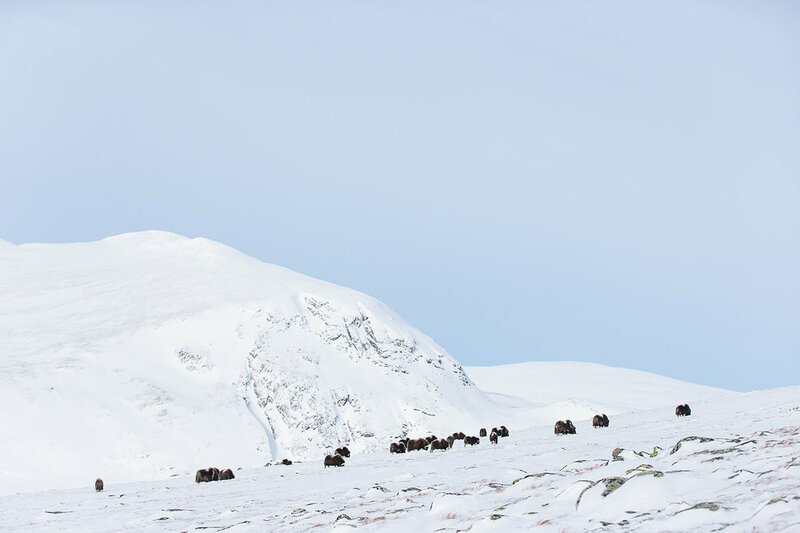 Everything was perfect, beautiful evening light a large herd of musk ox only a few hundred metres away. But I soon discovered this trip was not going to be a walk in the park and with dismay the herd quickly disappeared over the mountain top. 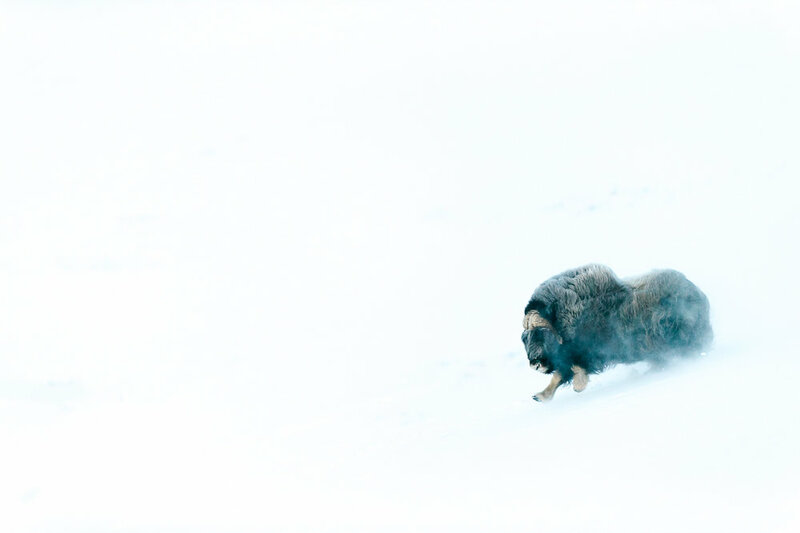 With such pace and with the light closing in for the day there was no way of following the herd. Oh well, this was only day one and hopefully we would have more luck over the coming days. After a while of searching we managed to find the small group resting on a steep slope. By this point the cloud cover had really rolled in and conditions had turned pretty dull and grey. So after a while of sitting and watching the group we decided to head back to the tent under the cover of darkness. The plan was to get back up to this group the following morning. Following this encounter we lost track of the pair. This meant a tough slog back up the hillside carrying all the camera equipment in deep snow. After a brief search around the hilltop we managed to find the pair again, and great news this pair had managed to find the group of bulls we were photographing yesterday evening. This group would become our main focus for the duration of the trip. We spent the rest of the day with the group. It was good to see the group up close and resting, showing they were accepting of our presence. This was the first opportunity for me to start getting a few of the shots I had in mind before the trip. Day 4 was by far the most productive day of the trip. 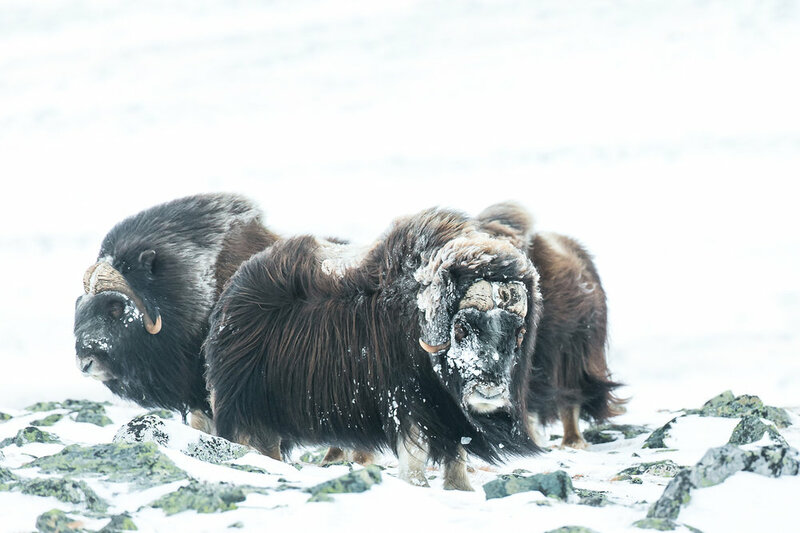 The previous evening we had a clear sky above, we set the alarm for 4.30am to reach the musk ox for sunrise. This sounded like a good idea the night before, but not sure I will moan about getting out of bed in a nice warm house so much again. Crawling out of a sleeping bag at -19 and getting dressed is not the most pleasant of experience. Floris popped his head out the tent to see if it was clear but as soon as he shouted the word "dudes, get out of the tent: northern lights". I was out the sleeping bag and all my thoughts of cold have disappeared. Sadly the dust concentration was very low, making the Northern Lights appear grey to the naked eye. It was still a great way to start the day and not something you wake up-to everyday. After this we quickly get some porridge down, put on the head-torches and headed up the mountainside following our usual route. 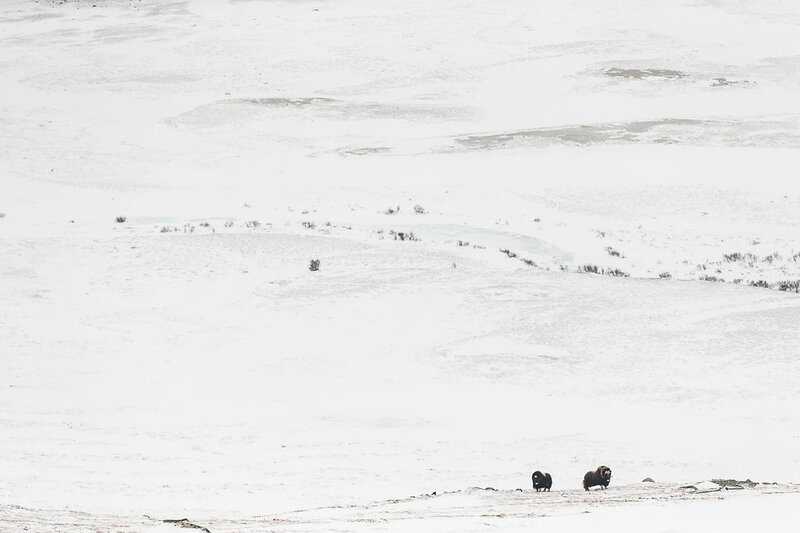 After about an hour or so of hiking we managed to find the small herd of bulls we had been working with over the previous few days. 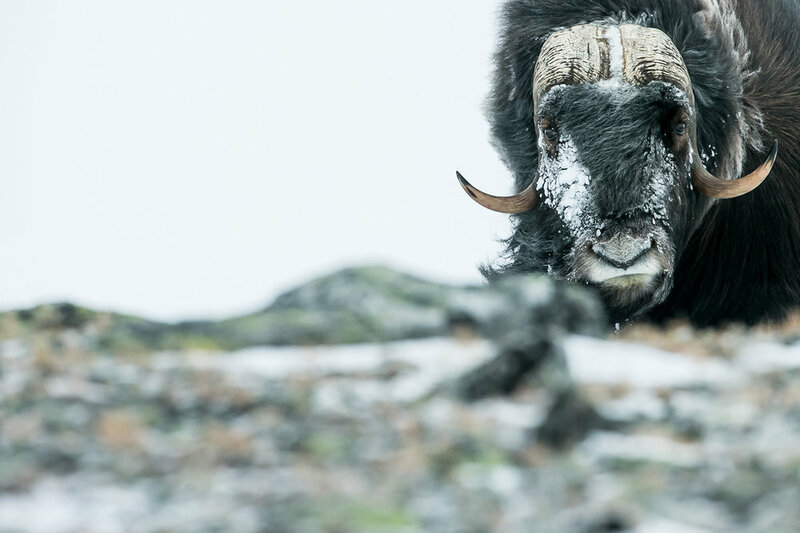 The herd was resting on the top of a slope as we positioned ourselves half way down an adjacent slope and set up the cameras. The first bull decided that there must have been better feeding conditions at the bottom of the slope. He then charged down the hillside to the bottom. I was gutted I missed this first opportunity and thought I had missed my chance. But no need to worry one by one the herd took it in turns to charge down the hillside. The first light had not quite hit a hillside during the sequences below, but still made for for some of my favourite images from the trip. After this bit of excitement and with the first light about to hit the hillside. We decided to charge down the mountainside ourselves. 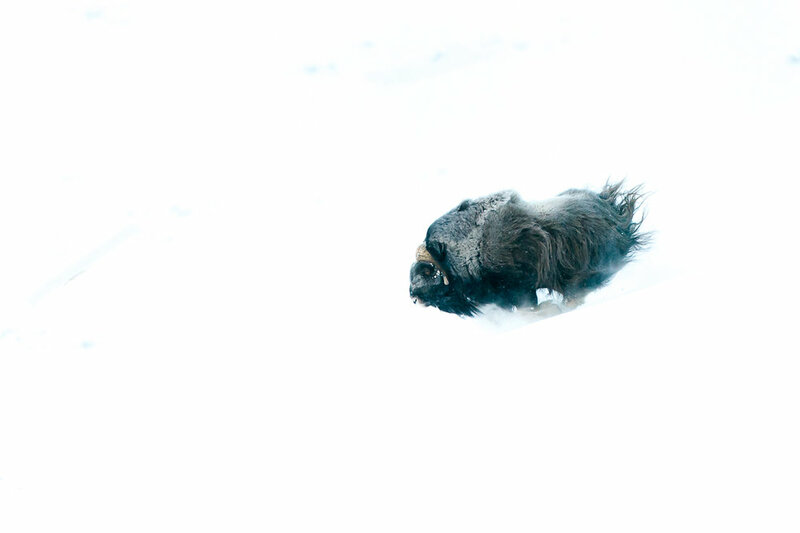 Not quite as graceful as the musk ox, though with snow at least half a meter deep in places it was tough going. After a few crazy minutes trampling down the hillside trying to balance backpack, camera & tripod without slipping. 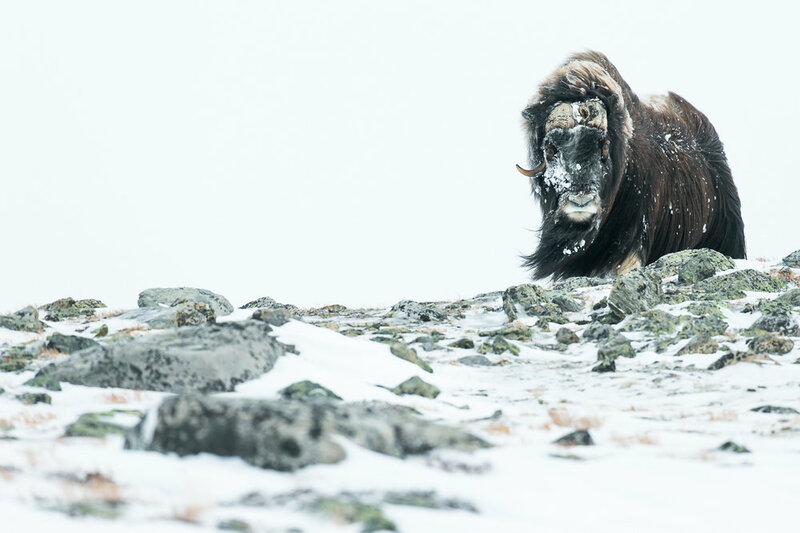 We managed to catch up with the musk ox. Sometimes in wildlife you can get lucky, but then I think it is more about making your own luck and this was one of those moments. Just as I managed to re-mount my camera to the tripod at the same time first light was hitting the hillside. 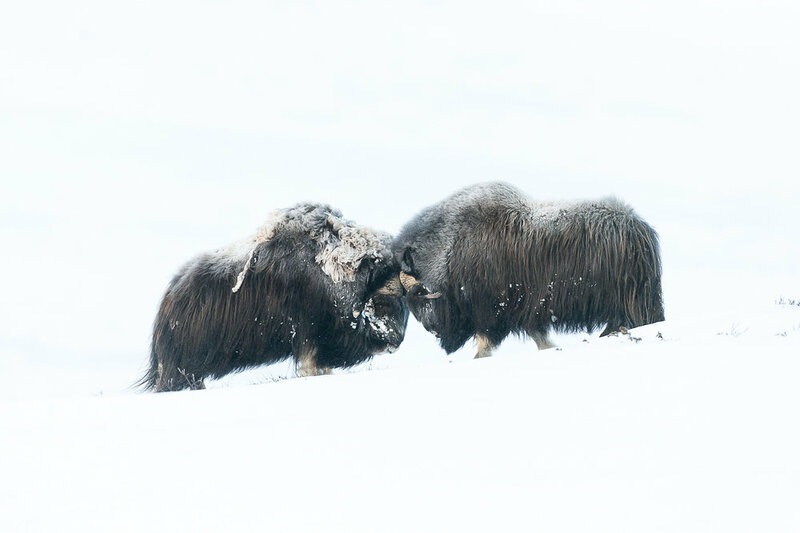 Two big bulls starting sparring in the perfect setting of a clean white backdrop. After this the herd lay down to rest so we decided to treat ourselves to a nice warm cup of tea and toast to the great last hours photography. 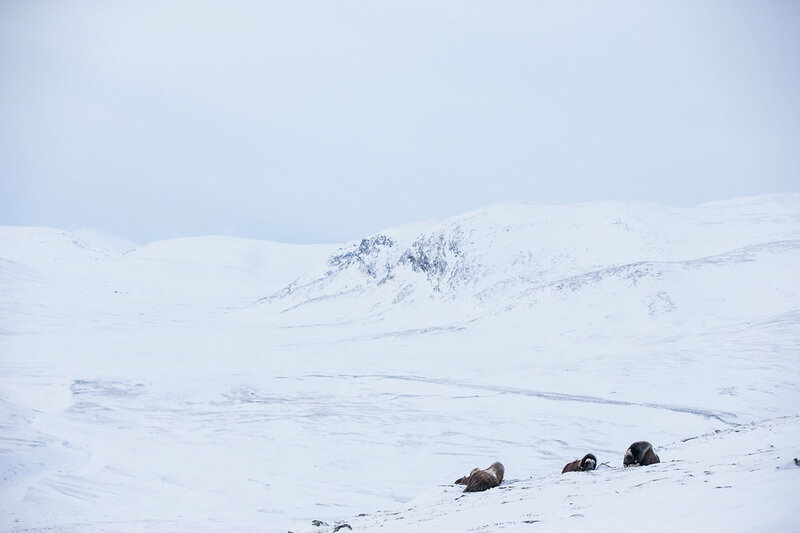 This kind of felt like a fitting end to my Winter adventure in Dovrefjell. As soon we had to start the long hike back to the tent and decamp ready for the huskies picking us up later that day. 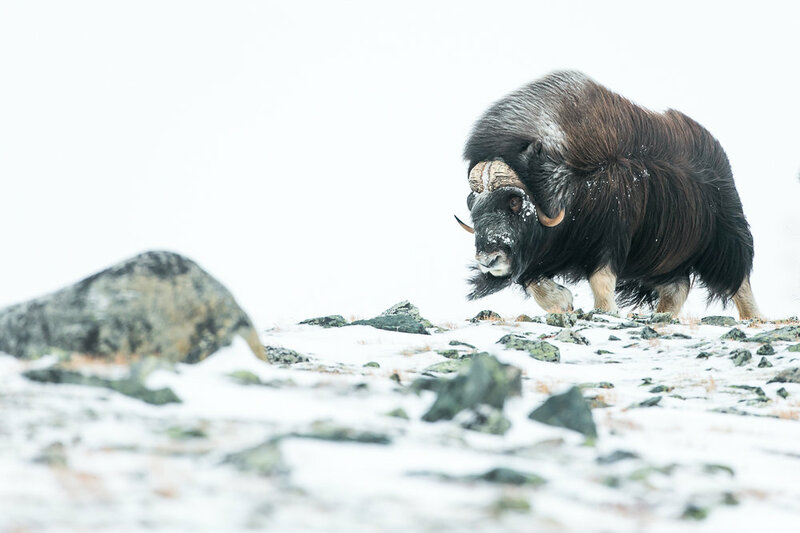 All of a sudden the wind picked up and the musk ox frantically moved further down the hillside. When the wind picks up it creates a crazy environment to photograph in causing the snow to drift across the hillside making it difficult to see let alone photograph but these were the conditions I had envisaged before this trip. In true Hollywood style it was all coming together in the final moments of the trip. 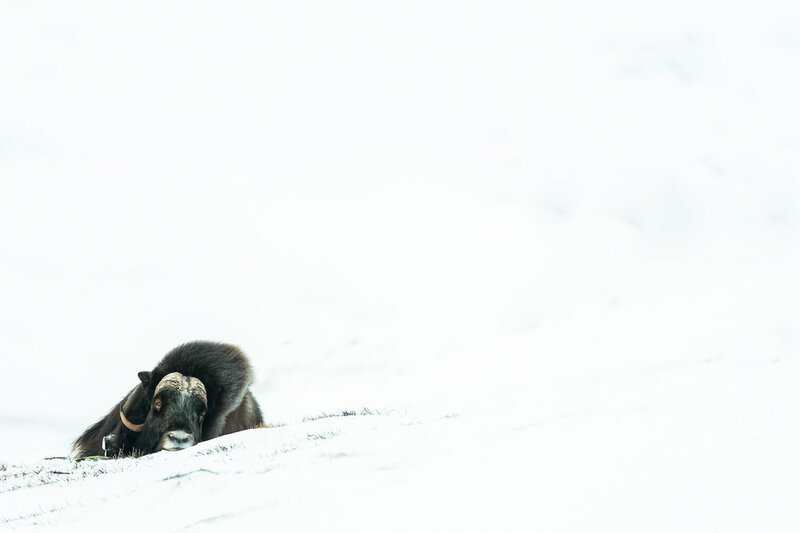 I have photographed in difficult conditions before, but this was something else. 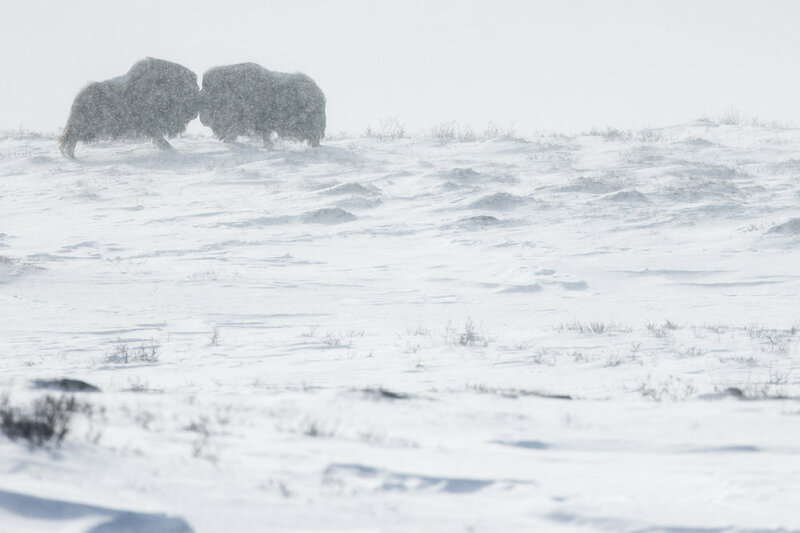 The wind was constantly whipping around snow everywhere down your lens and it was difficult to keep it clear. To make it more difficult my viewfinder was completely frozen over so you never knew whether it was the lens or the viewfinder that was fogged over I could only hope it was the viewfinder. 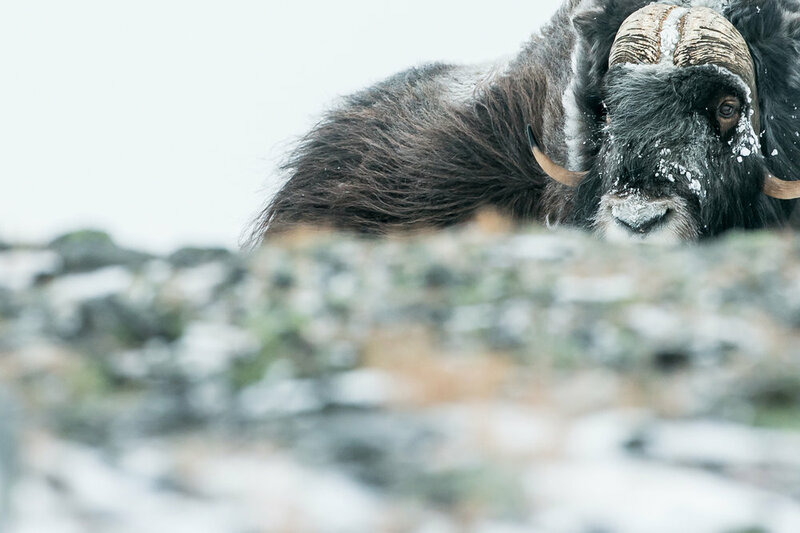 These days modern camera's autofocus is spot on under most conditions, but this is one of those occasions when you had to use manual focus with everything that was going on the autofocus simply could not pick up the musk ox. Below is a few of the images from this sequence. This was a great adventure and thanks to Floris Smeets for all his hard work in organising everything for the trip. It was also great to meet talented Dutch photographer Johannes Klapwijk. The one slight downside which was coming home with frost st bite across 3 fingers. After a quick visit to the hospital there was no tissue damage, so should heal themselves up over the next few months. 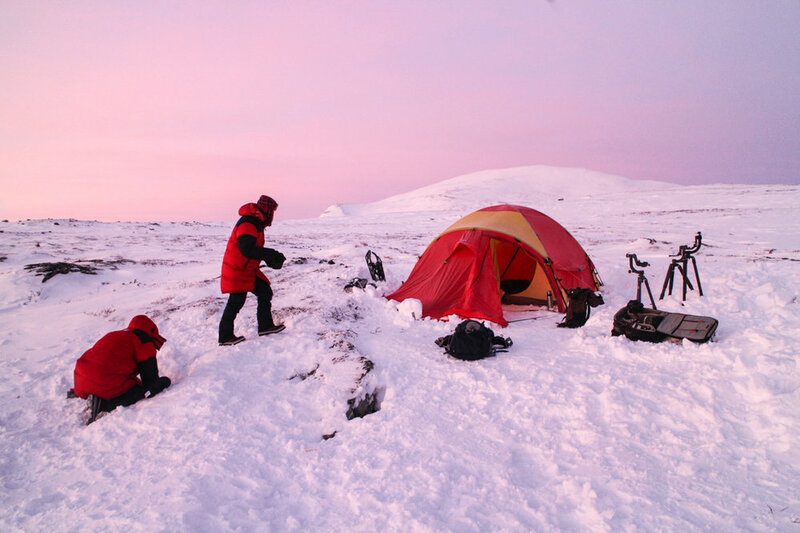 This was my first taste of the harsh Dovrefjell Winter and hopefully one day I will get the chance to return and relive the adventure all over again. 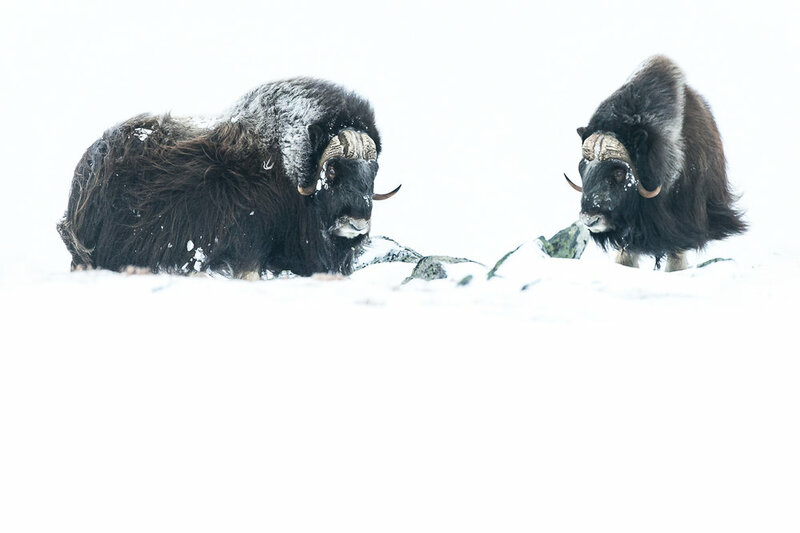 Fingers crossed next I will get some much harsher weather to really showcase the tough conditions the musk ox face each Winter. For now I need to recover and put my fingertips in a warm bowl of water. I hope you enjoyed reliving the experience through my words as much as I did taking the images.